Dredging the Costa Concordia from the depths into which it sank has made major news lately, but I think this deep-sea discovery is even more noteworthy and far less sad. 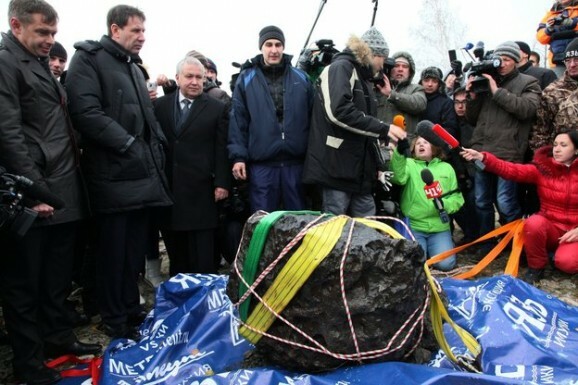 Divers hauled up a 1,255-pound, five-foot-long meteorite from Lake Chebarkul in Russia. They won’t scale it and cook it for dinner, but that’s still one hell of a fishing trip. You might remember reading and seeing videos (such as the one below) last February when a huge meteor barreled into the atmosphere and set off shockwaves that injured over a thousand residents and caused significant damage to buildings in Chelyabinsk, Russia. Ever wonder what happened to that meteor? Wonder no more. Remember the so-called Sutter’s Mill meteor that lit up the night sky over California last year? If you’re like me, it’s impossible not to hear that name and think of Grover’s Mill from Orson Welles’ 1938 broadcast of War of the Worlds. While that ruse supposedly brought alien life to the surface of our planet, this visitor brought something unexpected along for the ride as well. When the flaming space rock made landfall in April 22, 2012, it carried ingredients for life in the form of molecules of organic matter heretofore unseen in meteorites. After examining the meteor fragments, researchers think this discovery could provide insights into the primordial ooze from which life on Earth sprang. When working with samples such as these, scientists can typically remove the organic material by using various solvents. When the team went at these particular extraterrestrial rocks, the process detected compounds that haven’t been seen before in similar finds. This discovery indicates that there could be a wider variety of organic compounds lurking out there in space than previously believed. Whatever this discovery turns out to be, a glimpse into the origins of life on Earth, or just a set of elevated hopes, it should be an interesting story to watch develop over time. If there’s one thing YouTube has done, it’s increase the quantity of mean pranks in the world. After all, back in the day you could trick your brother into thinking he was being buried alive or kidnapped by terrorists, and you and your buddies could have a good laugh about it while running away from your now-axe-wielding brother. But in this digital age, you can do all that, film it, and then post it online so millions of other people can have a good laugh (without the annoyance of having to flee your now-axe-wielding brother). But once you use modern technology not just to share your evil deeds, but to create said evil deeds, now we’ve taken it to the next level. The poor schmoes in the video about think they’re coming in for a job interview, only to be tricked into thinking they’re about to meet a horrible, apocalyptic doom courtesy of a meteor slamming into the Earth only a few blocks away. It’s obviously an ad for the Ultra HD TV used in the prank, but it’s funny enough I can forgive a bit of crass consumerism. Not only did the brilliant meteor that recently lit up the sky over Russia bring to mind scenes from Michael Bay’s epic space adventure Armageddon, but it kicked off something of a scientific scavenger hunt. Collectors, researches, and treasure hunters out to make a quick buck have begun scouring the region near the Ural Mountains in hopes of finding rock fragments that could be worth some serious coin. One such searcher posited that the stone splinters may be worth up to $2,200 per gram, which is more than 40 times the current price of gold. This all depends on how much is ultimately found; the more scarce the item, the more valuable it will be to collectors and scientists. Representatives from the Urals Federal University found 53 small meteorites around Lake Cherbarkul, near Chelyabinsk, approximately 950 miles east of Moscow. While all the shards were tiny—between .2 to .4 inches across—scientists theorize that some larger chunks could have landed in the lake, where a 26-foot-wide crater appeared in the ice on the surface. There’s been much talk lately of asteroid DA14, the 50-meter-wide space rock that’s zipping past the Earth later today, but it turns out the universe had an early surprise opener in store for us. Early Friday morning what’s believed to be a meteorite arced through the sky above Russia, resulting in shattered windows, some astonishing video footage, and a whole lot of surprised Russians. Russia’s Interior Ministry says that around 1,000 injuries have been reported, including 200 children. Thankfully, it sounds like most of the injuries are not serious. Most of the injuries reported in the Chelyabinsk region, some 950 miles east of Moscow. As many as 3,000 buildings have sustained damage, mostly from the shockwave as the meteor broke up during its entry through the atmosphere. 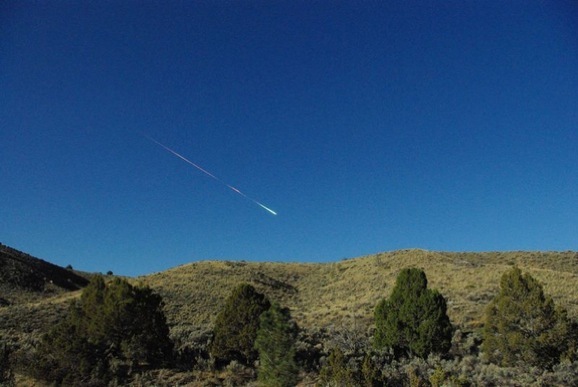 The meteor blazed through the morning sky around 9:20 a.m. local time. Understandably, early reports were contradictory and occasionally bonkers, with the expected rumors of UFOs and at least one report that the meteor had been “shot down” by Russian fighter planes. Expect that to be dissected thoroughly on the conspiracy theory forum of your choice. Every couple of years, one of the television networks trots out an end of the world miniseries. Meteors used to be the destruction method of choice but in recent years they’ve gotten away from falling rocks. But now, death by flaming boulder is back in vogue and NBC is trotting out a new miniseries called Meteor next weekend starting on July 12th.